Much hype surrounded the months before the opening of this concept bookstore. Part of the intrigue was the fact that it was housed in a historical hundred and fifty years old building. When talks actually turned to turning the massive main hall into a bookstore, it was deemed the walls and the ceiling were too high. Drawing inspiration from a painting - Rene Magritte’s Golconda - the architect solved this problem by turning the bookstore into an indoor mezzanine, giving the entire setup a light and airy feel. There are now 10000 books on display here, spread over a thousand square meters. For book lovers this is an unmissable stop. How popular is Carturesti Verona? People normally club together Bellu Cemetery and Romanian Boutique while planning their visit to Carturesti Verona. Bigger on the inside! Stepping into Cărturești Verona is like hopping down a rabbit hole into a marvelous land of books and other merchandise. One could easily get lost wandering from room to room looking for their next read. A great little bookshop, that is anything but little. One of the best locations Carturesti has. The place is just lovely and it's like you enter a whole new world. They also seem to have more products than the other locations. It's roomy, with 2 floors. Plenty of books. Kind staff. There are a lot of other things beside books, like mugs and tableware. There is also a spot with comic books and manga. Some Star Wars figurines and merchandise from iconic movie and game franchisees. Even if you don't find what you are looking for, you'll love wasting your time there. Wonderful book shop, which sells all kinds of stationery, trinkets and children's toys as well. 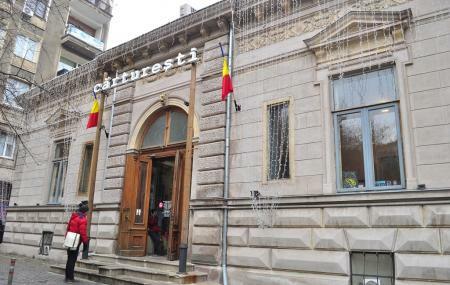 A must-visit place if you're in Bucharest.